This First Men: Neil A. Armstrong canvas goes beyond some grainy film footage to show an impressive shot of Neil Armstrong’s foot, as there are no decent photographs of the first man on the moon, celebrating that moment. 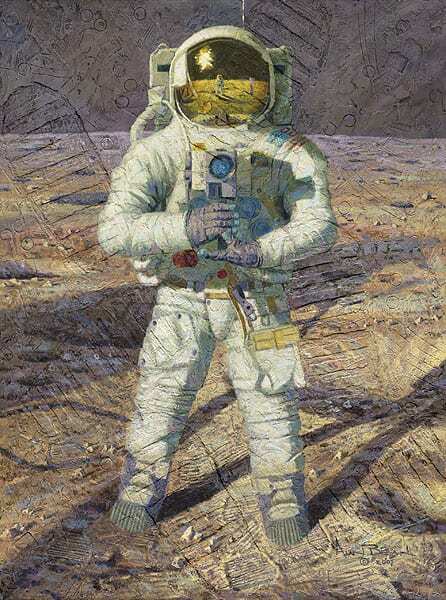 Fellow astronaut and artist Alan Bean set out to fix that issue when he created his painting, First Men: Neil A. Armstrong which stands (no pun in intended) on its own or as part of its companion piece, First Men: Edwin E. “Buzz” Aldrin. “I think this painting is exactly how Neil Armstrong looked as he took the now iconic photo of his companion, Buzz Aldrin,” Bean says.